The Schedules are ready!!! Scroll Down. 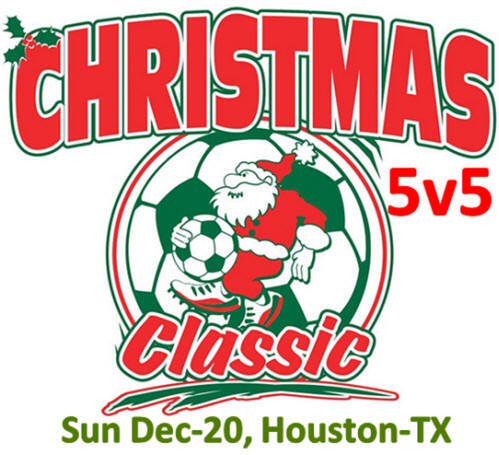 This tournament is of the 5v5 format (4 players plus a goalie) to help develop all players their individual skills. Only a one day tournament. The games will be played in nice grass fields. -- Age groups: unlike must tournaments, this tournament will be calendar year (January 1) and NOT STYSA format (August 1). These will be the age groups we will have (please notice the calendar year). -- Minimum 3 games in normal circumstances. -- Location: All games will be played at the FC Houston Fields, which are located behind Eiland Elementary School (6700 N. Klein Cir, Houston TX 77088). -- Deadline to register a team is Monday, December 14 , 2015. -- Schedules will be ready on Tuesday, December 15 , 2015. Entre Fee per team: $70 plus referee fees. See discounts available above. -- The team representative will show the tournament officials a copy of the birth certificate and a player ID (the tournament will not keep anything except the official roster). Awards: The winning team will receive a team trophy, a complete set of jerseys for all its players, and medals. The second place team will receive medals to each of its players. Point System: 3 points for a win, 1 for a tie and 0 for a lost. Tie breakers: Most Points, best goal differential, more goals scored, head-to-head and coin flip. Goal Differential: There will be a limit of 5 (five) goal differential (plus or minus) in each game. Maximum Number of Players: The maximum number of players a team may have is 8. A team may not have more than 8 players in its roster. Referee Fees: Each team must pay the referee fees "before" the game starts: $25 per team per game. Extra Time: In games where there has to be a winner, there will NOT be extra time. The winner will be determined by FIFA style penalty kicks (3 each). Proof of Age: Coaches must have a folder with all the player's copy of birth certificate and a an ID with the player's picture and name on it. (an offcial, current STYSA ID will be sufficient proof of insurance). This documentation may be required at any moment. Protest of Player's Age: A team may protest the age of up two players from the other team. The other team must produce the proof of age of each of the protested players. Failure to do this will result in the suspension of the player. Furthermore if the player looks much older (by the tournament director) and the player has played, then the team may forfeit the game. Girls: we encourage girls to play soccer. Girls in age groups Under-11 and younger may play one year older. In age groups U12 to U14, girls may play 2 years older. In ages U15 to U16, girls may play as long as they no older than 21 years old. Age Groups: Youth age groups may be combined when there are not enough players in one particular age group. * Subs only when ball is not in play with the referee's permission (from midfield). * All re-starts are indirect kicks except PK's. * No throw-in, all kick-ins. * Distance to ball must be at least 3 yards. * Red-Card: a team must play short 3 for minutes and the player who got a red card may not play in the game anymore. * PK is 6 yards away. * Minimum of 4 players to play. * Referee may start the clock even if the players are not ready at the designated time. * Teams must be ready to play at designated time, there will be no waiting time. * All teams must be in one side and fans in the other side. * Goal-kicks maybe taken any where with-in the circle area or even by hand by the goalkeeper. * No kick or throw inside the keeper area may pass the half-line in the air. If so, an inderect free kick will be awarded at midfield to the other team. * No re-start, with the exception of PK's, may go to the opposition's keeper area in the air. If so, an indirect free kick will be awarded at the keeper area to the other team. * Do not park in undesinated areas. * 1 minuto de medio tiempo. * Cambios solo cuando el balon no esta en juego y con el permiso del arbitro (de medio campo). * Todas los re-empezadas son indirectos excepto los penales. * No saques de banda, todos son kick-ins. * Minima distancia al balon es de 3 yardas. * Tarjeta Roja: el equipo debera jugar corto por 3 minutos y el jugador quien obtuvo la tarjeta roja no podra jugar por el resto del partido. * El penalty es a 6 yardas. * No hay fueras de lugar. * Minimo numero de jugadores para jugar es de 4. * El arbitro puede empezar el tiempo aunque los equipos no esten listos. * Todos los juegos empezaran a la hora designada, no abra tiempo de prorroga. * Todos los equipos deberan estar de un lado de la cancha y los fans en el otro. * Los saques de meta podran ser tomado de cualquier parte adentro del area grande o tambien puede ser sacado con la mano por el portero. * El balon no puede ser pateado o aventado con la mano en el area despues de media cancha en el aire. Si es este el caso, un tiro libre indirecto en la media cancha sera otorgado. * En ningun tiro directo o indirecto, con la exceptcion de un penal, puede ir en el aire al area del portero. Si es este el caso, un tiro libre indirecto en el area sera otorgado. * No se estacione en lugares no designados. Schedules are Ready NOW. Note: fields numbers will be assigned Saturday Night.